It is with great sadness that we announce the passing of Isadore (Ike) Yellowega on August 5, 2018 at the age of 83 , after struggling with kidney failure and Wegners Arthritis, at the Dauphin Personal Care Home. Ike was born on the family farm in Mink Creek to Steve & Cornelia (Smelski) Yellowega on June 10, 1935. He attended the Doreshenko School till grade 8. While going to school in the morning he set up traps in the river and after four he checked them, sometimes no luck. While helping his parents on the farm he also worked as a mechanic in Ethelbert for John Mandryk at the Texaco garage. Ike played any instrument but mostly the fiddle. He played for weddings, socials, anniversaries, midnight frolics and New Year’s dances. Many times he would come home in time to milk the cows. While attending a friend’s wedding in January of 1965 he met the love of his life, Esther Lysohirka (Zawasky), when he asked her for a dance. They got married on September 18, 1965. Ike worked as a mechanic for Cockshutt in Swan River and later for Allard Motors where he got his automatic transmission certificate. Ike’s parents where retiring, so Ike & Esther moved to the farm in June 1968. Ike built his own garage and started his own mechanic shop and retired after almost 30 years, but that didn’t stop him from working on small motors when we moved to Gilbert Plains. 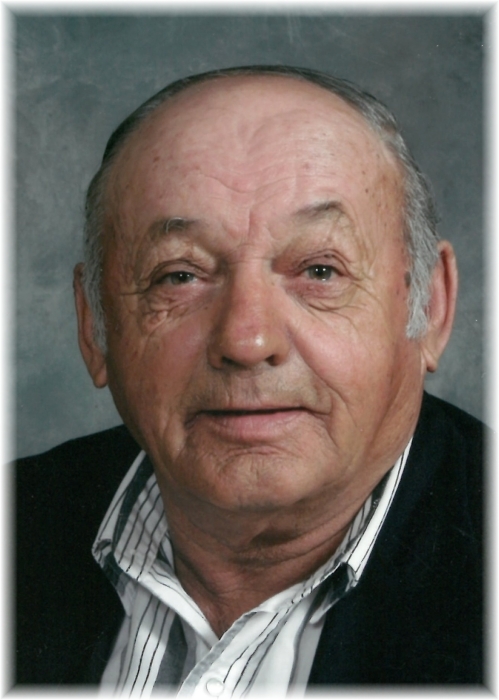 Ike worked for Gilbert Plains Co-op as a mechanic & TR Rentals for several years until he turned 65 he then retired and moved to Dauphin. Ike liked to fish but most of all he liked to hunt and he enjoyed camping. Ike wasn’t much for travelling but in 1973 he flew to Toronto to visit his uncles, aunties and cousins. The last trip was to Kelowna in 2009 where they visited Esther’s sisters, brother and many nieces and nephews. When Ike married Esther he gained an instant family with Esther’s daughter Julie. In 1967 Karen was born, 1968 Cindy came along and finally Lorraine in 1970. No luck for Ike with boys. Ike was kept busy driving when the girls became involved in sports and 4-H. When they attended weddings he always made sure to have a dance with his girls. Left to cherish his memories are wife Esther of 53 years; daughters Julie (Terry) Lesiuk, Karen (Rob) Dreger, Cindy (Tom) Olinyk and Lorraine; granddaughters Cassandra Lesiuk and Brad Lewis, Michelle Olinyk and Tanner Mulder, Allison Olinyk and Colton Dudar, Taylor Olinyk; grandsons Colin (Lorissa) Lesiuk, Scott (Kelsey) Dreger, Ryan Dreger; great grandchildren Katie & Carter Kowalchuk, Lauren and Autumn Lesiuk; great granddaughter Kennley Dreger; great grandson Copeland Lewis; great grand twins Link & Aria Dreger. Ike is also survived by sister and brother in-laws, cousins, nieces, nephews and extended family. Ike was predeceased by his parents Cornelia (Smelski) in 1974 and Steve Yellowega in 1979; father-in-law Harry Zawasky in 1974 & mother-in-law Lillian (Rewniak) in 2000; step granddaughter Krista Lesiuk in 1981; brother Gene Yellowega in 2009; godchild Ken Warelis in 2000 and many cousins, uncles and aunties. As per Ike’s wishes cremation has taken place. In lieu of flowers donations can be made to the Friendly Corner Bake Shop in Grandview or a charity of one’s choice. Prayers were offered on Tuesday, August 14, 2018 at 7:00 pm from Sneath-Strilchuk Family Care Centre in Dauphin, MB. Funeral Service was held on Wednesday, August 15, 2018 at 10:00 am from Sneath-Strilchuk Family Care Centre in Dauphin, MB with Very Rev Father Oleg Bodnarski officiating. Interment followed in Holy Trinity Ukrainian Catholic Cemetery in Mink Creek, MB.